Bail refers to the release from custody of an accused before trial. The South Carolina Constitution guarantees that all persons accused of a crime are entitled to bail pending trial, except in capital cases or offenses punishable by life imprisonment. The Constitution also provides that excessive bail cannot be charged. No judge can set bail at a figure higher than an amount reasonably calculated to insure the presence of the accused at trial. See Stack v. Boyle, 342 U.S. 1, 72 S.Ct. 1, 96 L.Ed.3 (1961). In South Carolina, the overwhelming majority of bonds are set by the Summary Courts. Summary Courts are the Magistrate Courts and the Municipal Courts. Bonds are set by Spartanburg County Magistrates a number of times each day, every day of the year, including holidays. In most cases, the bond proceeding takes place in the Magistrate Court Offices at the Spartanburg County Detention Center. The terms "arraignment" and "bond proceeding" are used interchangeably. Two things are usually accomplished in this proceeding; First, the defendant is advised of the nature of the charges and advised of the rights afforded to him by the law. Second, a bond is set by the judge. If a defendant is charged with a capitol offense, or one which might be punishable by life imprisonment, the magistrate, by law, cannot set the bond. It must by set by a Circuit Court Judge. Also, the magistrate might deny bond in certain cases involving violent crimes. Defendants are not required to enter a plea at the bond proceeding. The accused's record of flight to avoid prosecution or failure to appear at other court proceedings. These eight factors are used only to determine the accused's likelihood of appearance in court and the danger he will impose on his community upon his release pending trial. The amount and type of bond set are not in any way a determination of guilt or innocence nor an indication of the punishment that might ultimately be imposed if and when the accused is convicted. Any person charged with a non-capital offense is entitled to be released on a personal recognizance bond, without surety, unless the court determines in its discretion that such a release will not reasonably assure the appearance of the person as required, or unreasonable danger to the community will result. A personal recognizance bond is posted by the accused executing Bond Form I, in which he acknowledges indebtedness to the state which would become absolute upon his failure to comply with the conditions of the bond. Bond hearings are usually conducted by magistrates every day at the Spartanburg County Detention Facility at 11:00 a.m., 6:00 p.m., 9:00 p.m., midnight, and thereafter as needed. Victims of crimes, when it is requested, are informed of bond proceedings and the release of defendants. Victims are entitled to attend bond hearings and/or advise the magistrate of problems they anticipate encountering if a defendant is released on bond. Sections 16-3-1505 through 16-3-1565 of the South Carolina Code of Laws (Supp. 1998) contain the laws concerning victims' rights. For further information concerning victims' and witnesses' rights as they relate to the Summary Courts, see Section D in the Criminal Chapter of the Bench Book. Anyone can now sign up anonymously to receive notifications if a certain inmate is released or escaped through the Statewide Automated Victim Information Notification (SAVIN) system. Having a surety sign the bond with the accused. The defendant may obtain a commercial surety. A list of licensed bondsman with telephone numbers is made available to all detainees. Professional bondsmen can charge a fee of up to 15% of the bond. This fee is not refundable, even if the defendant is ultimately found not guilty of the offense with which he is charged. "'Accommodation Bondsman' means a person who has reached the age of eighteen years, is a resident of this State, who, aside from love and affection and release of the person concerned, receives no consideration for action as surety, and who endorses the bail bond after providing satisfactory evidence of ownership, value, and marketability of real property to the extent necessary to reasonably satisfy the official taking bond that the real or personal property will in all respects be sufficient to assure that the full principal sum of the bond will be realized in the event of breach of the conditions of the bond. 'Consideration' as used in this item does not include the legal rights of a surety against a defendant by reason of breach of the conditions of a bail bond nor does it include collateral furnished to and securing the surety so long as the value of the surety's rights in the collateral does not exceed the defendant's liability to the surety by reason of a breach in the conditions of the bail bond." The Magistrate Court at the Spartanburg County Detention Center has access to the assessor's tax records for Spartanburg County. Any state resident owning real estate in Spartanburg County who wants to act as an accommodation bondsman can go to the magistrate court's office in the Detention Center and file an application. The clerk will examine the assessor's records and determine the assessed value of any real estate owned. After deducting the value of any liens, judgments, other outstanding bonds, and the homestead exemption, the clerk will determine the amount of bond that can be signed. 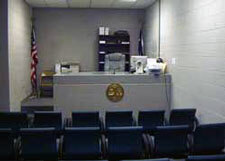 Anyone wishing to act as an accommodation bondsman should go to the magistrate court at the Detention Center with picture identification (such as a driver's license), the address of real estate owned, and the balance of any liens and judgments owed, as well as a list of any other bail bonds on which (s)he is presently obligated. State residents owning real estate in other counties may also act as an accommodation bondsman, but must bring appropriate documentation to prove their property's value and ownership.